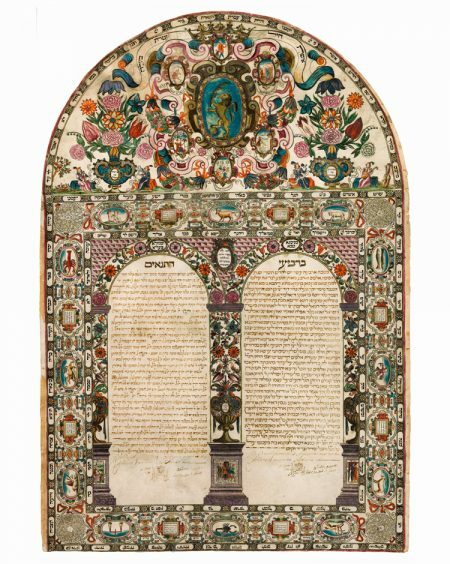 The lavish decoration of this printed and hand painted ketubbah attests to the high esteem in which this art form was held by wealthy Sephardim living in the ghetto in Venice. The practice of ketub- bah illustration was introduced in the ghetto by the ponentini community, exiled immigrants from the Iberian Peninsula, who continued this tradition from medieval Spain. As the exceptionally large dowry of this ketubbah shows, the leading pontenini families were extremely successful in Venice. The text is divided into two sections: the ketubbah proper at the right and the conditions at the left. They are set within a double arch, which, according to Proverbs 31:31 inscribed on the central spandrel, is symbolic of the gates where the virtuous house- wife was praised. This idea is strengthened by the tiny scene at the bottom of the central column, depicting the wedding of Ruth and Boaz, which took place at the gate (Ruth 4:11). The side columns feature additional wedding scenes inspired by Jewish texts (Genesis Rabbah 68,3 and the story of Rebecca at the well). The association between the ideals of marriage from the past with Jewish life in contemporary Italy is further illustrated in the six vignettes that surround the central area containing the emblem of the bridegroom’s family, De Almeda. Each scene refers to one of the verses of Psalms 128, which extols the merits of the family. Many other miniatures and decorative features crowd the border. Flanking the two urns of flowers above the text, and accompanied by quotes from the Song of Songs, are couples who also serve as allegories of the senses. The frame enclosing the text is dominated by painted Signs of the Zodiac. Their counterclockwise arrangement reveals that the artist was Jewish. The signs are interspersed with plaques containing a wedding poem by the Italian poet and kabbalist, Rabbi Mordecai Dato (1525?–1593?). At the four corners are elaborate geometric designs inscribed with miniscule square writing, which, together with inscriptions along the frame, present the entire book of the Song of Songs. This border was so admired that it was later imitated throughout the Veneto. Dowry: 10,000 current (Venetian) ducati, 6 litrin and 4 soldi the ducato, of which 9,000 in cash, and 1,000 in moveable items and bed linen; increment: 5,000 ducati; total obligation: 15,000 ducati.